Also known as Brigit and Birgitta. The most celebrated saint of the Northern kingdoms, born about 1303; died 23 July, 1373. She was the daughter of Birger Persson, governor and provincial judge (Lagman) of Uppland, and of Ingeborg Bengtsdotter. Her father was one of the wealthiest landholders of the country, and, like her mother, distinguished by deep piety. 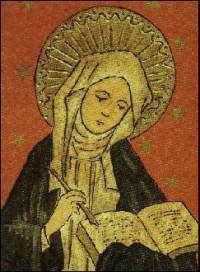 St. Ingrid, whose death had occurred about twenty years before Bridget's birth, was a near relative of the family. Birger's daughter received a careful religious training, and from her seventh year showed signs of extraordinary religious impressions and illuminations. To her education, and particularly to the influence of an aunt who took the place of Bridget's mother after the latter's death (c. 1315), she owed that unswerving strength of will which later distinguished her. In 1316, at the age of thirteen, she was united in marriage to Ulf Gudmarsson, who was then eighteen. She acquired great influence over her noble and pious husband, and the happy marriage was blessed with eight children, among them St. Catherine of Sweden. 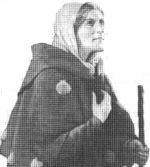 The saintly life and the great charity of Bridget soon made her name known far and wide. She was acquainted with several learned and pious theologians, among them Nicolaus Hermanni, later Bishop of Link�ping, Matthias, canon of Link�ping, her confessor, Peter, Prior of Alvastr�, and Peter Magister, her confessor after Matthias. She was later at the court of King Magnus Eriksson, over whom she gradually acquired great influence. Early in the forties (1341-43) in company with her husband she made a pilgrimage to Santiago de Compostella. On the return journey her husband was stricken with an attack of illness, but recovered sufficiently to finish the journey. Shortly afterwards, however, he died (1344) in the Cistercian monastery of Alvastr� in East Gothland. Bridget now devoted herself entirely to practices of religion and asceticism, and to religious undertakings. The visions which she believed herself to have had from her early childhood now became more frequent and definite. She believed that Christ Himself appeared to her, and she wrote down the revelations she then received, which were in great repute during the Middle Ages. They were translated into Latin by Matthias Magister and Prior Peter. St. Bridget now founded a new religious congregation, the Brigittines, or Order of St. Saviour, whose chief monastery, at Vadstena, was richly endowed by King Magnus and his queen (1346). 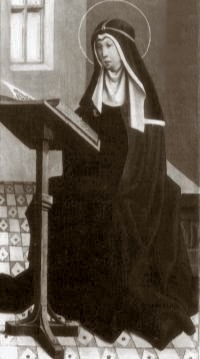 To obtain confirmation for her institute, and at the same time to seek a larger sphere of activity for her mission, which was the moral uplifting of the period, she journeyed to Rome in 1349, and remained there until her death, except while absent on pilgrimages, among them one to the Holy Land in 1373. In August, 1370, Pope Urban V confirmed the Rule of her congregation. Bridget made earnest representations to Pope Urban, urging the removal of the Holy See from Avignon back to Rome. She accomplished the greatest good in Rome, however, by her pious and charitable life, and her earnest admonitions to others to adopt a better life, following out the excellent precedents she had set in her native land. The year following her death her remains were conveyed to the monastery at Vadstena. She was canonized, 7 October, 1391, by Boniface IX.